As we continue to move forward, Valencia High School faces new challenges every day. Because of these challenges, our fundraising has never been more important to support the quality education and activities offered here at Valencia High School. During Spring Break, please consider doing your shopping for clothes and accessories at the O'Neill Store located at the Anaheim Garden Walk from April 2nd - April 8th during normal store hours. 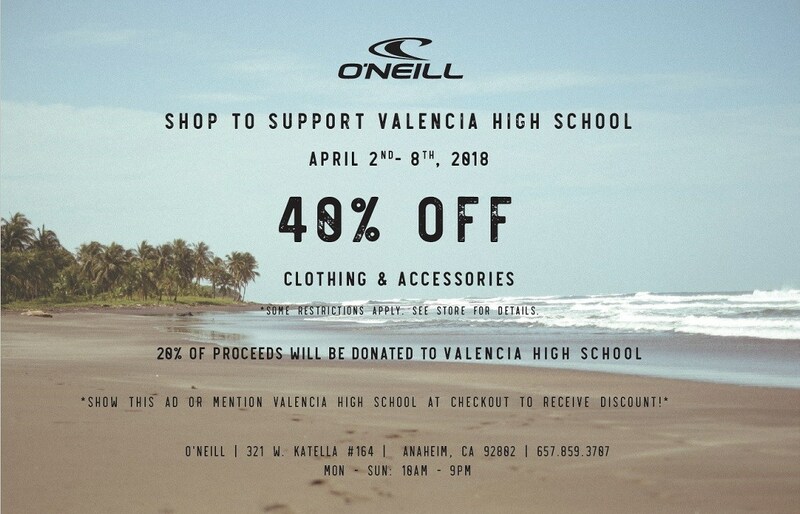 If you mention Valencia High School or show the flyer (the flyers will be sent to you by e-mail), you will receive a 40% discount on all O'Neill items or a 10% discount on items that are not the O'Neill brand. 20% of the proceeds from your purchase will be donated back to the Valencia High School ASB. It's a great way to shop for spring and summer clothing while helping the school. And, its the kind of clothes your kids like to wear.